I’m still amazed at just how forward thinking the video game industry was in the early ’80s. Intellivision had PlayCable (a video game channel that would rotate a selection of games to play each month) and for multiple consoles there was the GameLine. 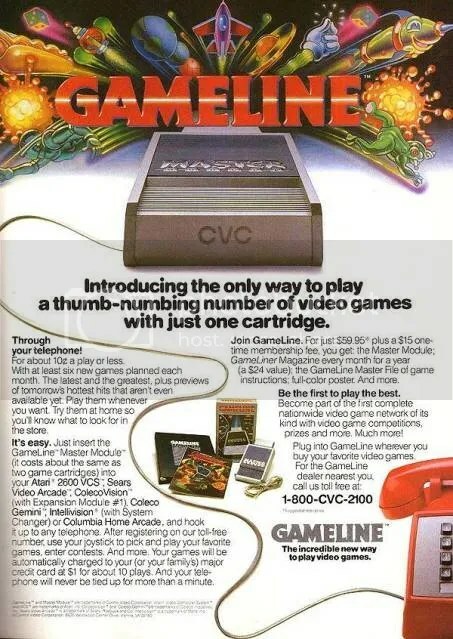 GameLine was produced by the Control Video Corporation and allowed for game downloads through the use of a special dial-up modem for “about 10¢ a play or less” according to this print ad. As you can read, for $59.95 + $15 membership fee you got not only the GameLine Master Module modem but also a monthly magazine called GameLiner which I imagine would be really interesting to flip through. GameLiner featured info on new GameLine games, tips & tricks and a list of all games offered on GameLine. Users were given a pin to log into CVC’s computer to download games. You would pay the small fee to download the game but the catch to this service is that after about a week or so you would have to log back into CVC and pay again to continue playing the game. I wonder if you could download multiple games at a time or were stuck just playing the one until you were locked out of it? Though the service offered a decent amount of games, all of the GameLine games were third-party (CVC couldn’t even get the Atari game license) and featured none of the major publishers of the day like Activision, Mattel, Parker Brothers or Coleco. A lack of support from the majors coupled with the video game crash of ’83 means GameLine didn’t last long but I have to give them credit for such a cool product. I have no doubt if I were old enough at the time, I would’ve been begging for my parents to get me GameLink for my birthday or Christmas. CVC’s vision did not stop with GameLine. There were a number of other “Lines” they had planned: NewsLine, StockLine, SportsLine, MailLine (YES — email), BankLine, OpinionLine (message boards!) and InfoLine. None of these services came to pass due to the company going out of business but it still boggles my mind to think of something like this taking place in 1982 or 1983. Overall, a pretty cool piece of video game history.